Most of us are aware we’re supposed to brush and floss our teeth regularly. We see the toothpaste ads and hear our dentists and hygienists talk about the importance of dental homecare. And yet, not everyone heeds the advice. Some people forget to floss on a daily basis. Others don’t brush as long or as often as they should because they’re in such a hurry. And there are some who simply don’t see the importance of dental homecare. They don’t have any dental issues, so they don’t think the need for regular brushing and flossing is really important. While dental issues might not manifest immediately, down the road they will. And in the meantime, the lack of proper homecare can lead to other serious health problems. Today, we’re going to explain the link between gum disease and your overall health. Our hope is seeing the connection will help you see the importance of brushing and flossing goes way beyond trying to prevent cavities. So far, periodontal disease has been linked to the following five diseases. Studies are still being done, though, to determine whether gum disease is a contributing factor in other serious health conditions. Periodontal disease is an inflammatory disease. The antibodies in the bacteria can cause inflammation throughout the body, including the heart. 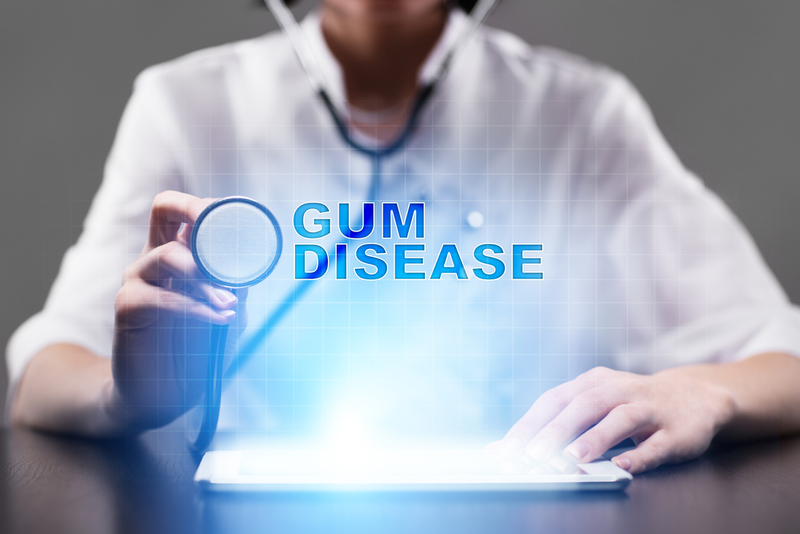 This is one of the first diseases linked to gum disease because of the prevalence of heart attack patients with gum disease. When gum disease is remedied, the risk of developing heart disease is reduced. This means regular, daily, proper homecare, is one of the steps you can take to reduce your risk of heart disease. Periodontal bacteria can end up in the blood stream. In turn, it can have an effect on clots in the blood and lead to a stroke. “While it’s still not clear why this happens, the link between stroke and this disease is quite strong” explains Dentrix Dental Care. Patients with gum disease have a higher concentration of bacteria in their mouth. If they happen to aspirate mucus or saliva, the bacteria can end up in the lungs and lead to a lung infection. Severe gum disease can increase your blood sugar levels. If you’re pre-diabetic, this can push you into full-blown diabetes. If you are already diabetic, it can lead to certain complications, like succumbing to infections. Back in 2016, the results of a study were released linking Alzheimer’s with periodontal disease. The study showed people with early stages of Alzheimer’s had greater incidence of gum disease. Antibodies in periodontal bacteria cause inflammation throughout the body, which might contribute to Alzheimer’s and accelerate its progression. Periodontal disease is one of the leading causes of tooth loss. How can this disease lead to the loss of teeth? We all start off with healthy, pink, firm gums. To keep them this way, we need to brush and floss regularly – this means daily. We need to floss once a day and brush at least twice, preferably after every meal. If we don’t practice good homecare, the bacteria-filled plaque grows on our teeth will accumulate. “Our sensitive gums don’t respond well to plaque and bacteria” states All In One Dental. They become inflamed and tender, and can bleed when we brush and floss. This is the first phase of gum disease. As the disease progresses, the bone, ligaments, and bone begin to recede away from the tooth. The teeth end up becoming loose and may eventually need to be extracted. In addition to brushing and flossing on a daily basis, another way to protect your health is with regular visits to your dentist. When patients come in our office for their three, four, six month periodontal supportive cleanings our goal is to make sure they are on track and healthy. These cleanings are very important for the patient’s oral and systemic health. Regular dental cleanings remove the plaque and tartar which patients can’t remove on their own. Tartar is plaque which has calcified and it can’t be removed with a toothbrush or floss. There might also be plaque and tartar under the gumline which is difficult to remove at home. Removing these deposits regularly helps prevent periodontal disease. And our periodontists can arrest the disease if a patient already has it. With the combination of daily home care and twice yearly dental cleanings, you can combat decay, periodontal disease, and even prevent more serious health conditions.